Provides 4.25 Hours of CLE Credit! Proven strategies and techniques from ten witness experts that can be used to train everyone in your firm on witness preparation! 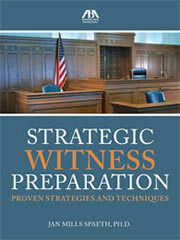 Author: Jan M. Spaeth Ph.D.
“Strategic Witness Preparation,” a DVD set providing 4.25 hours of CLE, is a unique, innovative and entertaining resource for attorneys who need to prepare witnesses for hearings, depositions or trials. This program focuses on witness preparation from the perspective of 10 well-known and respected trial consultants from across the country, who have years of experience and expertise in the field. This practical, original program covers a wide range of topics, including the 5 Elements and 10 C's of Credible Testimony, myths involving witness prep, developing rapport with clients and witnesses, the 3 Steps for witness responses, the 8 Critical Steps for witness preparation, and more. With humor and insight, these consultants provide sensible and novel recommendations for handling 13 of the most challenging witnesses. Extensive witness clips are used throughout the DVDs. A Study Guide accompanies this 2 DVD set. "If you ever prepare witnesses to testify, you need these DVD's on your shelf. They offer innovative and practical solutions to the challenges of witness prep from leading trial consultants. Organized by chapter topics, you can easily get to the advice you need to help your particular witness be her best, so you will use these DVDs again and again. This is must-see CLE." "The DVD's do a good job of discussing common types of witness problems and suggested measures to deal with those problems. A lawyer's trial preparation work includes actively making witnesses more credible. The DVD's are particularly useful in teaching trial lawyers that they do not need to "accept" trial witnesses the way they initially appear and present themselves. The DVD's are also particularly useful to trial lawyers who may not be familiar with the various things consultants can do to help witnesses testify persuasively at trial." "This program provides a critical examination of the most important, yet sometimes forgotten, part of any trial, the preparation of witness testimony. Jan Spaeth has gathered an array of America's best trial consultants to put together a comprehensive guide to understanding how witnesses communicate in court. Although I've been actively involved in the trial of criminal defense cases for over 45 years, I've never seen a program providing an in-depth analysis of the steps a careful lawyer should take in preparing a witness for trial. I found a good deal of the material provocative, providing invaluable insight into this important subject. The materials have a huge value to trial lawyers in making them mindful of their ability to improve witness' credibility. This program will provide a very useful tool." "I watched these 2 DVD's on Strategic Witness Preparation and was very impressed. First, I would note that the faculty of consultants assembled for the program was first rate, and their collective and individual academic and professional credentials were apparent. I found the presentation style and format to be interesting, informative, and enlightening. It never ceases to amaze me how we can always learn something new or different in areas where we, as lawyers, think we understand how things work."